What I usually dislike about snow in February is how it becomes dirty and crusty. This year it hasn’t had a chance. It just keeps falling incessantly. One winter about 10 years ago we had snow piled this high, but it had mostly fallen in one big storm. Sidewalks ran between walls of snow like the hedges of a maze. 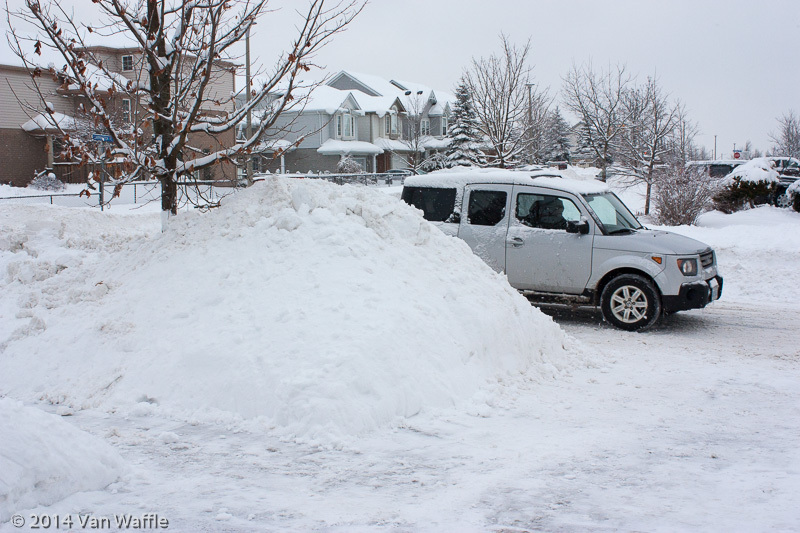 This year several minor snowstorms dropped the bulk of the piles that fill our front yard, but every day or two we receive at least a dusting. The usual January thaw – that would render it all crunchy grey but at least lighten the burden – did not occur. Shoveling has become almost a daily routine. Saturday I cleared an easy 3 cm that fell in the morning. In the evening we set out to drive to a concert but nearly got stuck in our street from steady snow over the course of the afternoon. Not knowing how much more would fall in the next few hours, we decided to turn back. Sunday afternoon it took me and Danny two shifts each to clear at least 15 cm. Now to find room we have to carry it around piles that have accumulated for the past month. By the time I finished clearing the last icy barricade left by the plough at the end of the drive, fresh snow was falling. The forecast promises some sunshine but temperatures still below normal right through the week, more snow on Wednesday and next weekend. It is beautiful. I am trying to like it. Really I am. Same problem here. I’ve given up shoveling with my usual meticulousness. Now it’s a lick and a promise. This is the first winter I remember bothering to shovel while it’s snowing in anticipation of the almost daily accumulation.